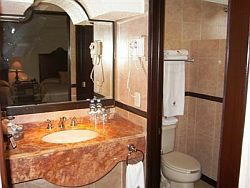 There are quite a few Guadalajara, Mexico hotels to select in downtown..one of them is the Hotel Morales. This is an exquisite hotel in historic downtown Guadalajara. And if you want to be in the heart of all the hustle and bustle then this one is for you.. I've actually had the pleasure of touring this hotel. I walked inside and you really can't tell how lovely it is from the outside, so don't let the exterior fool you. The interior architecture is elegant with tall ceilings and beautiful arches. 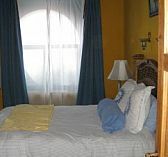 It's right by some churches and within walking distance to the Guadalajara Cathedral and other fun downtown sights. 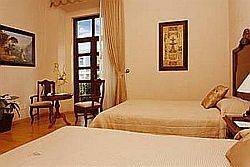 The rooms come with air conditioning which is great, because it can be hot during certain times of the year. This is one of the things you should look out for when booking a hotel, because some don't have it because usually the weather is great in Guadalajara. Some Mexico hotels don't have air conditioning because of this..
Do a Hotel Search or Find Prices! View More Guadalajara Mexico Hotels. I have to admit that it's nice to come home to a very cool hotel room after a long day of city exploring.. so this is a big plus! This hotel also strikes me as being a perfect hotel for business people because of its amenities such as a business center and a meeting room that fits up to 100 people. Its location in downtown also makes it easily accessible to the Expo-Guadalajara which is about 10 minutes away. You'll also find a bar with live entertainment on the weekends and a restaurant. Its proximity to the downtown area also makes it perfect for tourists to view the cathedral and World Heritage site of Cabanas Cultural Institute just a short distance away. Due to the location in downtown and the traffic, you should probably ask for a quiet room away from the street if you are a light sleeper as the noise may disturb you at night. 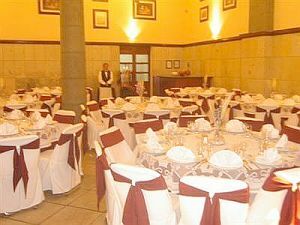 Also, if you are having a wedding in Guadalajara, Mexico hotels like this one would be great to book rooms for due to the closeness of a few churches including the always busy cathedral. They also have banquet rooms for receptions and dinner parties.